I had to go up to Snohomish, so I figured, what’s another hour up to Bellingham to see my boys? On my way up the 5 I had to snap this photograph. 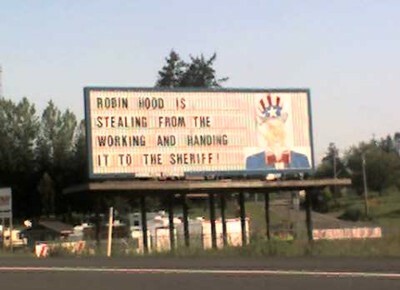 This is the famous 1-5 Redneck politics sign from Washington State. It’s always worth a look so see what they’ve got posted on it. The trip north wouldn’t be the same without it. 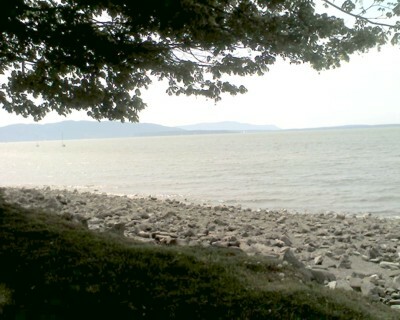 Here’s a picture of the bay itself. 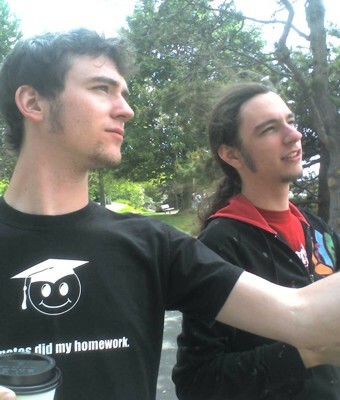 We stopped at a little coffee shop on the shore which was about half a mile or more from Old Fairhaven. There were a number of people and families there, a very nice spot. 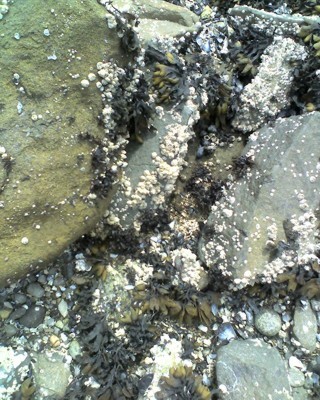 Here’s a picture of some beachy-barnacle rocks. Don’t pretend like you didn’t want to see a picture of these. I know everyone loves seascape barnacles as much as I do! lol. We also went to breakfast. Well, Michael and I did, at the Harris Ave Cafe. 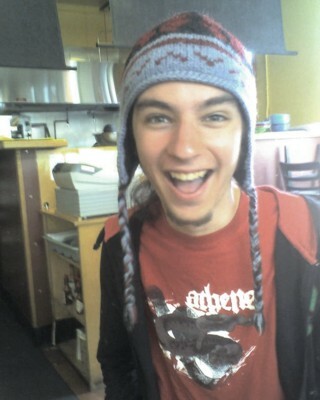 Michael submitted to a photograph wearing his favorite hat. I’ve been to the Harris Avenue Cafe before. It’s the kind of place you go back to. And, just for the foodies who might read this blog, here is a photograph of the eggs toulouse. 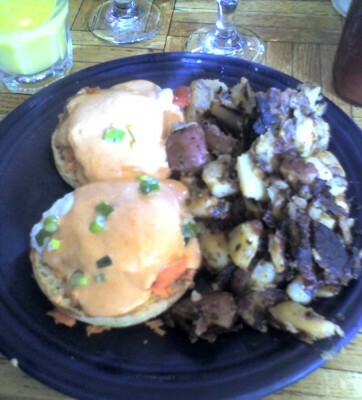 It’s an English muffin with poached eggs, smoked salmon, and their champagne cream tomato sauce. I had this last time, too. It’s wonderful. 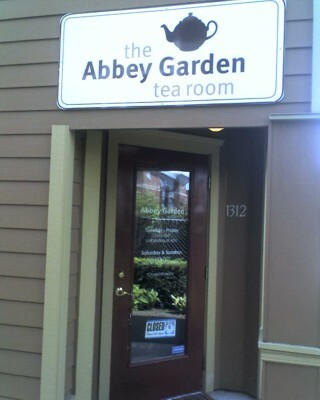 The only bummer of the day was that the Abbey Garden Tea Room was closed. WAH! What a tease to name something Abbey Garden Tea Room—a mix of British tea and Abbeys, my favorite things in the world come together—and then have it be closed. After dinner at a well-known local brewery (my eldest is now 21), we piled home onto the sofa to watch Hot Rod and play Apples to Apples. The trip was so much fun, and far too short. I’ll have to go back—soon.